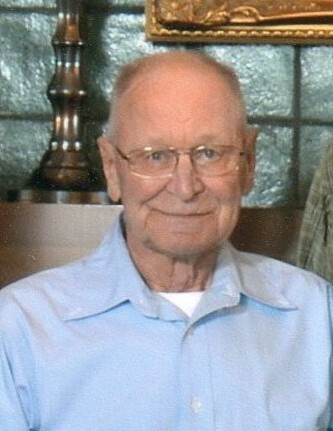 **Note change in time of Funeral** Funeral services for Maynard Pearson of Warroad, MN will be held on Saturday, February 16, 2019 at 5:00 PM at Zion Lutheran Church in Warroad. Visitation will be one hour prior at the church. Interment will be at the Norland Cemetery at a later date. Maynard Duane Pearson was born on June 4, 1936 in Warroad, MN to Martha (Anderson) and John “Windy” Pearson. He was baptized and confirmed at Immanual Lutheran Church. He grew up in the Swift area and graduated from Warroad High School in 1954. As a young man he worked for the Linder Brothers at their mink ranch. Maynard married Gwen Ellenson at Moe Lutheran Church in Roseau on June 16, 1956. The family moved to Milwaukee, Wisconsin for a short period of time. After Vicki was born, they moved back to Minnesota where he has resided ever since. Maynard worked at Marvins, Thermolite, Koenig Electric and Fish Electric, where he spent the majority of his career as an electrician. Over the years Maynard and Gwen enjoyed fishing on Lake of the Woods in the summer and winter. Many precious memories were made spending time on the lake with friends and family. The maintenance of his belongings was important to him. Very few people are able to say they had the same boat (his Super Sport) for 35 years. More recently he enjoyed daily cruises in his pickup. He liked to check out the lake, the town, and the surrounding area farm crops. He also especially enjoyed having his friends stop by for a visit and cup of coffee. He was a friend to everyone he met and will be remembered as a tender-hearted caring man, a good listener and a hard worker. Maynard was a wealth of knowledge and the first person we would call with any question. Watching the Minnesota Wild, the Minnesota Vikings, and the Minnesota Twins was a favorite pastime. Maynard passed away peacefully with his family by his side on February 12, 2019 at the LifeCare Medical Center in Roseau at the age of 82. Blessed be his memory. He is survived by his children, Vicki (Gary) Boekelheide of Warroad, Jeff (Paulette) Pearson of Salol, Jodi (Rod) Stomberg of Warroad, and Susi (Rod) Putney of Prior Lake, MN. 14 grandchildren; Jessica (Jeff) Dehn, Chelsea (Joe) Lennon, Kirsten (Cody) Crawford, Jeremy Pearson, Amy (Joe) Kramer, Justin Pearson, Amanda (Christopher) Kuznia, Derek Stomberg, Brent (Kelly) Stomberg, Deserai (Chad) Gerlach, Kayla (Cody) Kofstad, Alicia Putney, Garrett Putney, and Brenna (Glenn) Parker, 15 great grandchildren; Keaton, Orion and Ashton Dehn, Chelsie (Shane) Horner, Jacob Pearson, Ezra Kuznia, Treyton Stomberg, Shelby Williams, Kian Stomberg, Camden, Callen and Cecelia Gerlach, Paisley and Briggs Kofstad and Ashelynn Parker, and brothers John (Cathie) Pearson and Rod (Joyce) Pearson. He was preceded in death by his parents, John & Martha; his wife, Gwen; his sister, Sandra; and his grandson, Beau Putney. Rest in peace.